It's time to have a closer look at Whizz Bang!. There are so many blocks with different details and we'd be here all day if I tried to squeeze everything into one post so I've decided to spread the infornation out over a few posts. Think of it like progress posts but in reverse. So where did this quilt begin? Inspiration came from a few places but the initial spark occurred a few years ago, before my blogging days in fact. I made a pot holder using folded points. I followed the instructions of a tutorial on the Internet (I can't seem to find it now) and soon ended up with an interesting circle of points. I loved the look of all the layers and best of all it was fun to make! 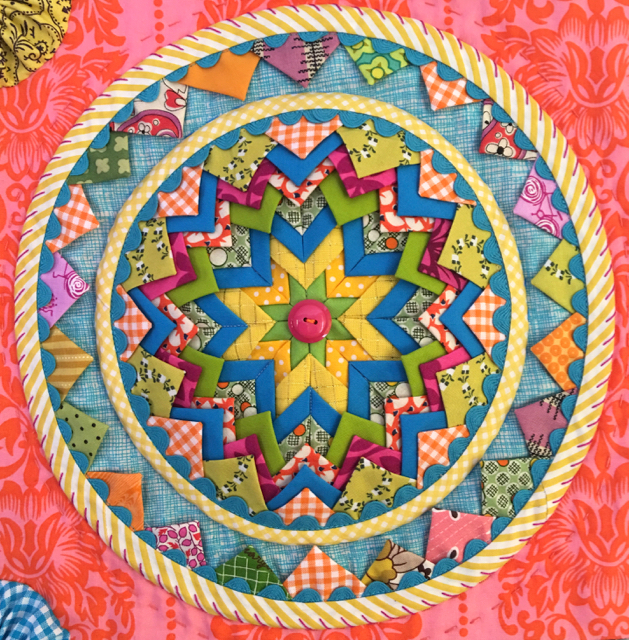 There are different styles of blocks in my Whizz Bang! quilt and the blocks in this post are most like the pot holder I made. I've constructed these circles in a different way from the pot holder but the points are neatly laid out to create patterns rather than the more haphazard placements of Pine Burr blocks that I'll show in the next post. This was the first block I made for Whizz Bang! People often say it looks like licorice allsorts and now that it's been pointed out to me I can't help but think that too. mmm licorice allsorts, yum! After making a few bright coloured blocks I decided to try something in softer, pretty, colours. The lace trim was the perfect finishing touch. Here is the last block I made, and one of my favourites. Anything with ricrac wins my heart. If you look at this block you'll see my fabric selection is really quite scrappy. I used different fabrics but in the same colourway. I like the interest mixed fabric adds and I believe it makes the overall look a little more dynamic, even if it's not so obvious. 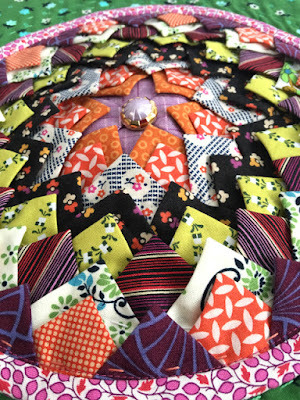 This photo shows some of the hand quilting with perle8 cotton through the points. Every secord or third row of points has been quilted. It was heavy going but I used big chenile needles and just got on with it. I broke a few needles along the way but that's okay. I've hand quilted a few denim quilts so I'm getting used to these big hefty quilts by now. My best tip of working on heavy quilts is to lay them over trestle tables. Whizz Bang! was resting on three trestle tables and I'd just swing it around or fold it to get to different areas I was working on. The reason I use trestle tables is that I can fold them up and put them out of the way when I don't need them. Here I am working late at night, like a busy little worker bee. 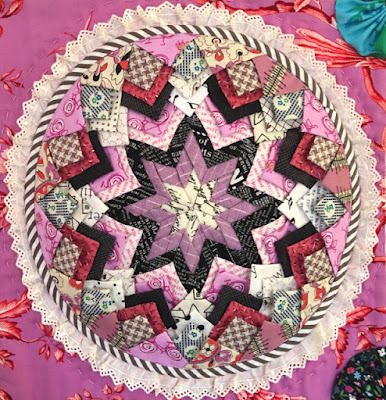 At the Sydney Show when I was chatting to people it was interesting to hear stories of them making these types of folded point blocks years ago for pot holders, cushions, decorations for childrens jackets, table mats Christmas decorations. A woman who had grown up in Malaysia had memories of making edges of photo frames with points of folded cigarette boxes. Let's leave it there for now. I'll be back with more colourful Whizz Bang! photos soon. I am completely in awe of this quilt Rachael, it is absolutely spectacular. I can't wait to see it in person as part of the best of Australia exhibition next year. You are so incredibly inspiring!! It's wonderful to read of your inspiration and process Rachael - Whizz Bang! is such an exciting, colourful quilt! I look forward to your next 'progress' report. I hadn't appreciated when I first saw this and its success, that this was such great fabric manipulation ! Stunning workwomanship and a wonderful idea! 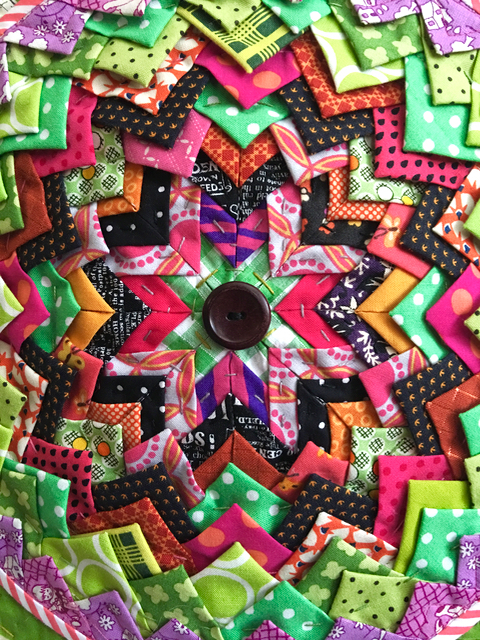 Wow Rachael, Your quilt is an explosion of colors ! I have seen a big quilt with just one enormous block like yours and it was called Pine Cone Quilt. Rachel this quilt is stunning and what an inspiration. I have the same potholder my mother in law made for me years ago! I also have the pattern somewhere? So how do you keep the points flat? Amazing! Thank you for pointing out the details of the scrappy fabrics, I love studying the details! Also, I'm a sucker for rick rack too, so that block really is special for me. I am so impressed with the hand quilting. I suppose machine quilting wouldn't have been much easier, but good for you for sticking with it. It must have made for some tired and achy fingers for a while. 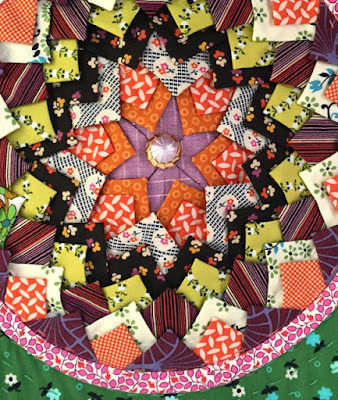 You look beautiful working on this colorful quilt! Oh, Rachael!! This is such a special quilt! I love seeing the bits of favorite prints popping up here and there. But the overall effect...stunning! These close ups of the blocks are making me very happy. Can't wait to see the rest! I could look at each one of these for an hour! So clever and spirited. Each one is a labor of love and ingenuity. Thank you for showing the close ups! I think I'd like to make some potholders now. Have you got a trick for putting the bias binding on the circles? Thanks for the close ups, I have always been intrigued by this block. You knocked it out of the park! Amazing! 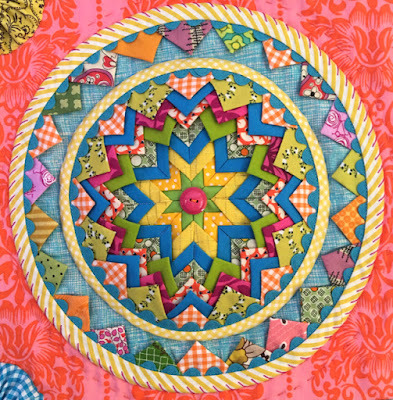 All the detail, the scrappy colour, the hand quilting... so much to look at! Lovely to have a close up look at each one too! It must have taken you ages to make? I remember making a few of those folded stars as Xmas wall hangings years ago. 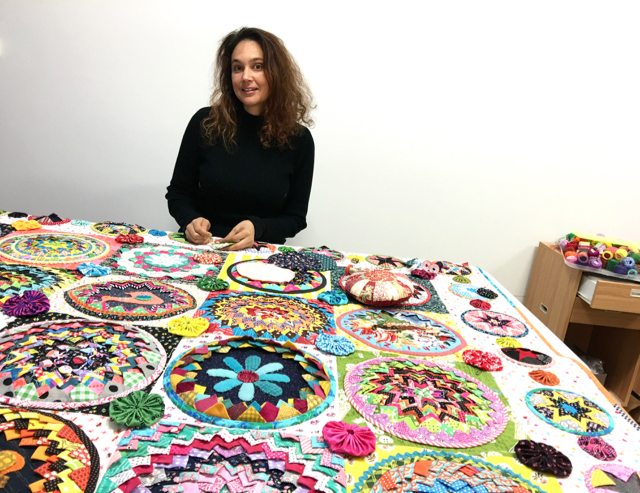 What a labour of love this quilt is Rachael! I can now admire not only your skill and creativity but your persistence in quilting this beauty! Did you ever think of giving up, or think yourself crazy for ever attempting it in the first place! You certainly DID deserve your award!!!! 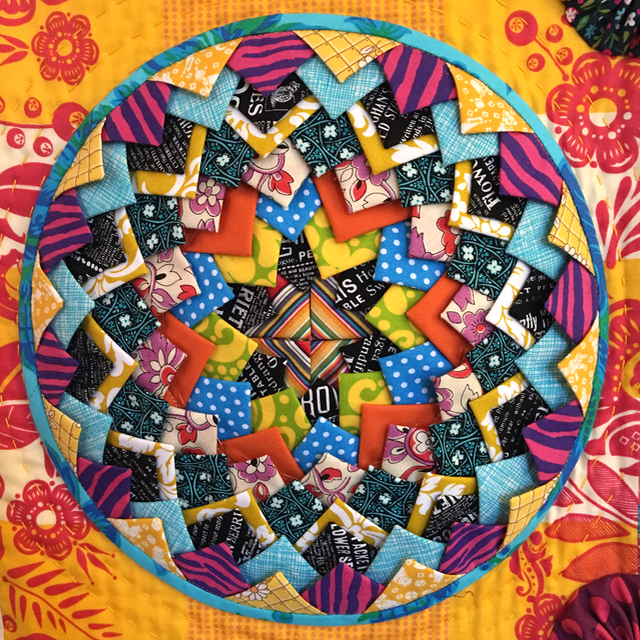 It looks like you are getting more and more three dimensional in your quilts. I feel like i am being drawn into a landscape, a quilty terrain. Amazing work, truly. You are so generous in sharing your techniques and thoughts about your work, it shows us that there is so much more to this creative art than meets the eye. thanks for sharing close ups of your work on this unique project. What an amazing feat of imagination! So much to see and study. The yo-yos are a cute touch. You must have really enjoyed chatting with all the admirers. One of the most amazing quilts I have ever seen. Hope you enter it in Houston and other international shows. Thank you for showing us some of your Whizz Bang blocks "close up", they are wonderful and yes, the first one does bring to mind liquorice allsorts - my mouth is watering at the thought of those delicious sweets! I remember making a small round mat way back when I began quilting, all that fabric for only just one mat, wonder how much yardage you used in Whizz Bang! Wow - this is simply stunning. 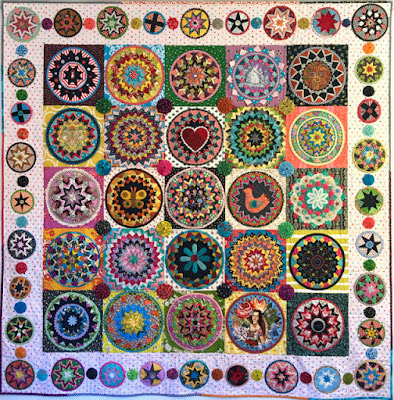 I am guessing that this is a rather weighty quilt in it's finished state. What a marvellous quilt! I have never seen anything quite like this before and wish I could have seen it at the show. All those folded points and all that stitching! It must weigh a ton! Your quilt is spectacular. The colours! The work, such purr-fectness! The detail in every block is wonderful. I really do need to go back over each photo to see what you have done. I love all the colour and the huge variety of fabrics. How are your fingers after all that hand quilting? Thank you for explaining how you work. I look forward to the next installment. Thanks so much for sharing your technique. 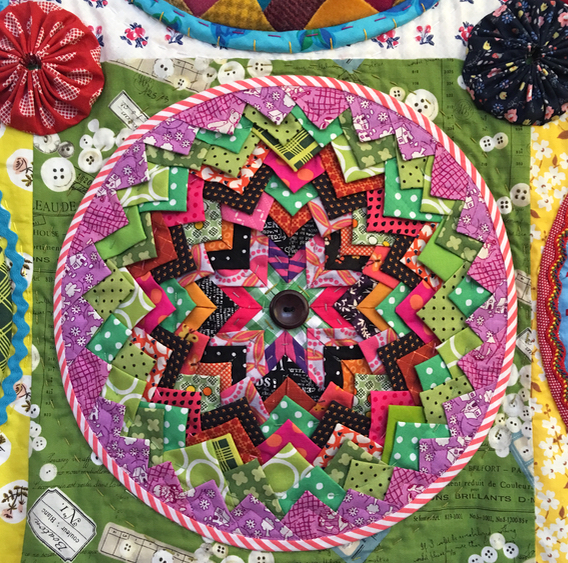 My first thought when seeing this quilt (well, actually my second thought after, "wow") was that it must weigh a ton! Your table method is very smart! Seeing the close ups gave me a whole new appreciation of your charming working. You have such a gift for combining colors and fabric patterns. I smiled at the folder fabric technique. I had used it years ago, but no where as cleverly and imaginatively. I'm glad you had the opportunity to chat with quilt show viewers and explained your techniques and inspiration. Just stunning Girlfriend.....I'm thinking of maybe going to Melbourne next year to see it....and you too of course! Wow!! I had no idea that the blocks were made this way - it looks so different from afar (in the pic). Very cleverly done and that's amazing quilting - how many layers?? OMG!!! No wonder The Textile Ranger was in awe of this :) I re subscribed and of course 'they' said I was already subscribed GRRR I'll have to take matters into my own hands and just keep checking up on you! what a fabulous job you did. Sitting here smiling at it! I've never tried making a folded star block and your pine cone blocks are great. That Aqua one is my favourite also. Thanks for the explanation of how you made them.